Boasting the best views of legendary sunsets set to the dulcet tones of Cat Man belting opera to his myriad feline companions, Mallory Square just might usurp Jimmy Buffett’s Margaritaville as the most popular place in Key West. Starting about an hour before the sun takes her daily siesta, the square teems with vendors and performers of all kinds peddling their wares and (occasionally questionable) talents to a crowd eager to catch a crepuscular rainbow. Arresting though the sunset may be, come Monday, April 15, the expansive Mallory Square will be used to its highest and most noble use — as the home of Taste of Key West. Now in its 24th year, Taste of Key West is a celebration of Key gastronomy that fea- tures our local restaurants at their best. 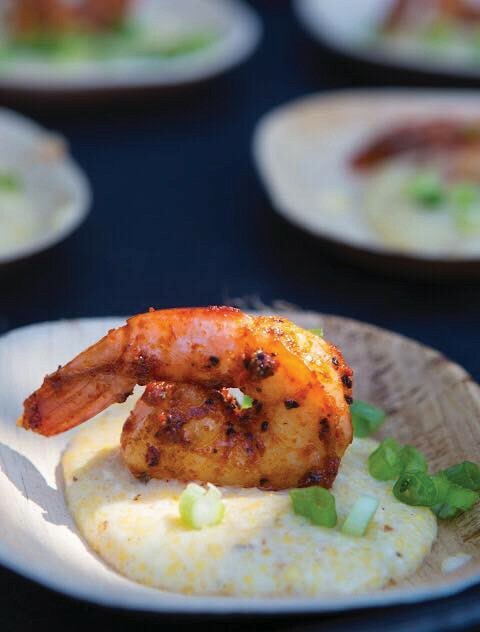 One of the best outdoor events of the year, it’s is like alfresco speed dating for foodies, a nonstop whirlwind of bite-sized treats and beverages guaranteed to delight your taste buds while the hues of twilight dance before your eyes. There is no shortage of reasons why Taste of Key West has endured for more than two decades in a town whose attention span typically lasts as long as that of the average goldfish. First off, there’s the location. The festival partners with the newly rebranded Margaritaville Resort, which has graciously offered to let Mallory Square’s usual band of street performers, artisans and cat acrobats set up their nightly performances along the hotel’s waterfront so that, for one night only, the square will be free and clear for Taste of Key West’s dozens of food booths and thousands of patrons. Second, in addition to wines from more than 100 vineyards (thanks to Republic National Distributing Company) and 25- plus brands of beer, Taste of Key West also features local libation outfits like Key West First Legal Rum Distillery. The breweries and distillers will be on hand to offer samples of their signature spirits that are known to pair well with, well, absolutely everything. Third, there’s the actual food lineup, a veritable who’s who of everything drool-worthy in town. So far more than 50 restaurants from the Lower Keys and Key West are taking part this year. There’s even a kids zone with carnival-style foods for those who haven’t yet graduated from ice cream cones to deconstructed lobster pot pie. With a constantly updating list of restaurants stepping up to participate, dishes are guaranteed to run the gamut of cuisines. And if the idea of fresh local seafood, meat grilled right in front of you, expertly paired vino and decadent desserts isn’t enough to tempt you, consider this: Every morsel consumed is for a good cause. That’s because Taste of Key West serves as the largest fundraiser for A.H. of Monroe County, with all food and labor donated by generous volunteers and businesses that look forward each year to supporting one of South Florida’s most beloved charities. A.H. of Monroe County provides care, advocacy, preventative outreach and assistance to people affected by HIV/AIDS. 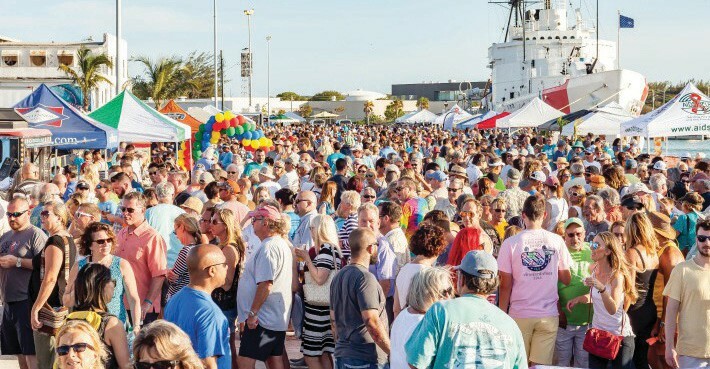 The nonprofit started Taste of Key West as a one-night-only fundraiser for the wide variety of charitable work it performs, which includes case management services, affordable housing, counseling, testing, educational outreach and more. What began as an evening of laid-back food and wine has blossomed into what is arguably the most anticipated culinary event of the year. Chefs from Key West’s best restaurants gathering seaside to show off their skills, much to the delight of an ever-ravenous crowd. Though the event is decidedly lighthearted, it serves to support a gravely serious cause — one that is very near and dear to the hearts of many who call Key West home. Those who lived through the AIDS crisis in Key West remember a dark time fraught with confusion, heartbreak and a pervasive sense of hopelessness. Lacking formal recognition from the government, with both its causes and treatments shrouded in mystery, many of those suffering from HIV/AIDS were subject to stigmatization and abandonment by their families, employers and communities. Long considered an epicenter of inclusivism, Key West became a natural hub for those suffering from the disease whose diagnosis had resulted in their exclusion from the world to which they had formerly belonged. Sufferers arrived in droves. And amidst a bleak and seemingly endless scene of death, A.H. (then called AIDS Help) arose to offer end-of-life care to those in dire need. From its modest beginning, the organization grew to serve thousands of individuals. To this day it remains the only community-based HIV/AIDS service organization in Monroe County. It has expanded its initial patient offerings and today is one of the most venerated nonprofits dedicated to helping treat, prevent and research HIV/AIDS. In February 2016, A.H. of Monroe County announced a new collaboration with Florida International University in the form of an internship program for graduate public health and social work students. Through the generous scholarship program and within rotating six-month semesters, students assess the evolving dynamics of the HIV/AIDS epidemic in order to aggregate and analyze data on HIV patients in Monroe County. It is the hope of FIH and of A.H. that this symbiotic partnership can help identify trends within the data to determine which areas of the community need additional attention, and in doing so, help Monroe County specifically to identify where the disease is trending and where A.H. can best focus its resources. In support of Taste of Key West, attendees can take heart knowing that in addition to gaining access to a smorgasbord of delectable food and drink, they are also helping fund a lastingly important charitable organization whose support can literally mean life or death to those suffering from a horrific disease. The evening is sure to be a who’s who of Key West chefs and personalities, with new restaurants signing on by the hour to participate. Tickets for $25 are available at www.keystix.com and guarantee entry to the event, $20 in food tickets and a wine or pint glass. “Date Night” packages for two are $65 and include two glasses of the buyers’ choosing, two plates and 50 food tickets. Seasoned veterans of Key West’s dining community know all too well that sometimes it can feel as though landing a reservation at one of the island’s top restaurants is harder than finding an Atocha coin while snorkeling at Fort Zach. So it’s a comfort to know that — for one night, at least — the hungry masses won’t have to fight over the last 8 p.m. reservation at Prime 951 or Santiago’s. 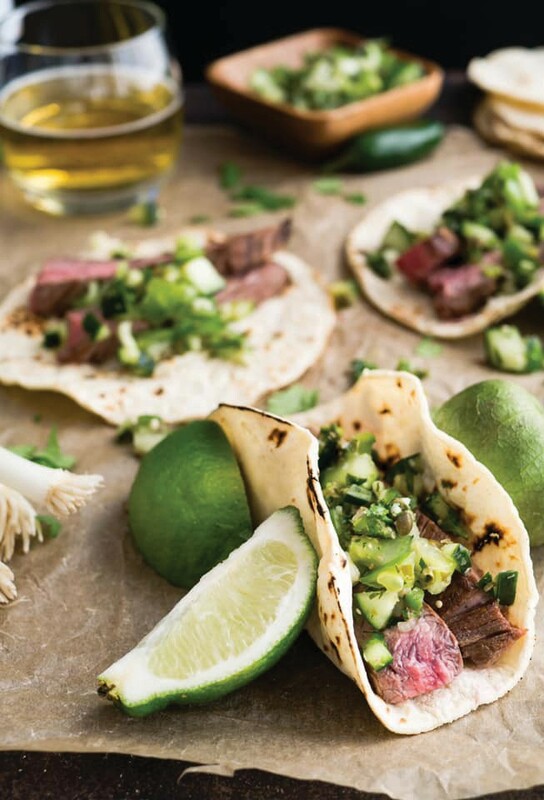 They can converge at the confluence of the Atlantic Ocean and the Gulf of Mexico, take in a breathtaking sunset while bathing in the tantalizing smells of masterful food mixed with a crisp sea breeze and indulge their taste buds happily knowing that they are supporting a wonderful cause.